Lee has written for Ringnews24 for over 7 years and he helps run the site on a daily basis. He has been a fan of the sport of boxing for around twenty five years. He enjoys traveling to watch fights in-particular trips to Las Vegas for big fight nights. Injuries in boxing are part and parcel of the fight game. It is of no real surprise to either the fighter or the audience when something physically goes wrong as a fight progresses. However, there have been several notable exceptions when constant bodily abuse in the ring takes it’s toll either after or before the final bell has sounded. 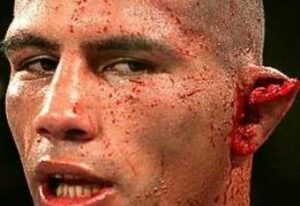 This article is going to take a look at eight instances when an injury to a fighter has stood out in particular for it’s severe visual context. Cover your eyes now if you do not want to continue, as this may get considerably gory! Former undisputed heavyweight champion, Evander Holyfield had just come away from a rather mundane trilogy of fights against John Ruiz and was attempting to box his way back up the title ladder when he faced Hasim Rahman in 2002. Former champion against former champion, Holyfield was outboxing Rahman for seven rounds before a clash of heads caused a bruise to appear over Rahman’s left eye that rapidly grew to unbelievable proportions! The bout had to be stopped after the very next round, with Holyfield declared the winner by a technical decision. This was to be the final fight for Lennox Lewis when he took on Vitali Klitschko on short notice after Kirk Johnson pulled out. 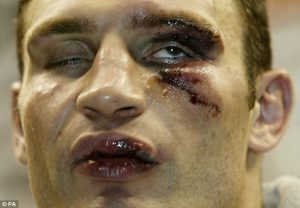 The Ukrainian was tough as nails and gave Lewis all he could handle for six rounds before the fight was stopped after Klitschko suffered a massive gash above and below his left eye. The wounds required sixty stitches, and even though Klitschko asked for a rematch and tried to bait his old foe into the ring for many years after, he had to retire knowing that it was never meant to be. 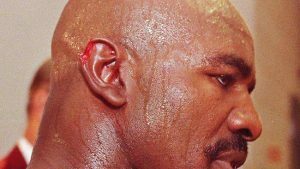 No matter what, the world could not have done anything to prepare for what we all had witnessed from all over the world when the ‘Baddest Man On The Planet’ bit a chunk out of Evander Holyfield’s ear in the third round of their much craved for rematch. That insane behaviour instigated a riot throughout the MGM Grand hotel, the location of the fight, and Tyson was heavily fined and banned for over a year from the sport that once rescued him from heading toward an almost certain life of crime and constant jail time. 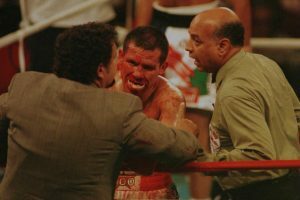 Mexican legend, Julio Cesar Chavez was making the seventh defense of his WBC light-welterweight crown against former gold medalist Oscar De La Hoya when a cut opened up over his left eye in the first round. Things got steadily worse as Chavez’ face gradually became to look as if he had literally dunked his face in a bucket of blood! Still, the veteran courageously pressed forward but the jab and smart boxing by De La Hoya convinced the doctor to finally stop the fight during the fourth round. 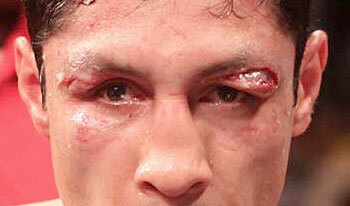 Their rematch two years later did not fare much better for Chavez. He was soundly beaten by his much fresher opponent and retired in his corner after the eighth round. 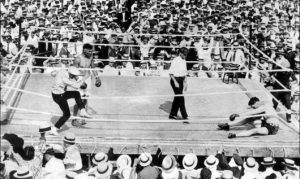 The ‘Manassa Mauler’ was intent on making an impression, and he cemented his fearsome reputation after brutally slaughtering champion, Jess Willard over the course of three rounds. Willard was put down seven times in the first round alone! Although reports on Willard’s injuries are not concrete, it is widely accepted that various injuries were inflicted upon him including a broken jaw, ribs, severe facial trauma and hearing loss in one ear. 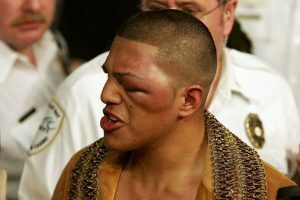 Fernando Vargas was in the process of making a comeback after being defeated by Oscar De La Hoya. He racked up four straight wins before facing Shane Mosley. But his left eye would let him down after it began to swell. 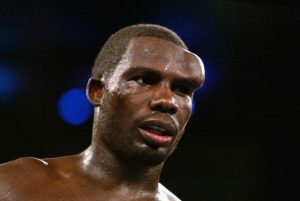 The protrusion eventually took up half of the left side of his face, so it was no surprise when he was told that he could not continue in the tenth round despite putting in a good effort. 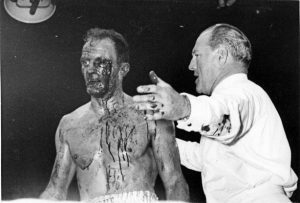 Most will remember this fight for Henry Cooper’s now famed left hook that floored Cassius Clay in the fourth round before the now heavyweight icon would shock the world by winning the heavyweight title. But the end result of their original encounter would see Britain’s “Our ‘Enry” get stopped in the next round, the fifth, after a cut opened up over his left eye that spilled blood in relentless fashion, provoking the referee to rescue him from further punishment. This fight granted Antonio Margarito the opportunity to become a big name in boxing, and he took that with both hands when he beat Sebastian Lujan in ten rounds after the champion’s left ear looked as if it was uncoupling from the rest of him. Lujan’s constant charging forward and throwing bombs could not do much to move the sturdy Margarito. In the end, he was made to look weary as he was getting caught regularly with power punches and Lujan’s team threw in the towel. Could we see Gervonta Davis vs. Robert Easter in 2018?